A Nelson and Colne College student who arrived in the UK from Spain in 2015 has won the UCLan Education Achievement Award after excelling in her studies. 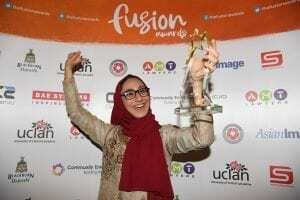 Art and Design student Aleena Nadeem was presented with her award by Russell Hogarth, UCLan Honorary Fellow and Community Ambassador, in front of 350 guests at the 2018 Fusion Awards at King George’s Hall in Blackburn. Volunteers and community cohesion campaigners joined entrepreneurs and sporting talent at the ceremony and Aleena attended alongside her family. Aleena joined NCC in 2015 on an exceptional basis and has since flourished in her studies achieving Triple Distinction* in her Level 3 Extended Diploma in Art and Design, displaying her natural talent for Textiles, Photography and Fine Art. This comes after completing her Level 2 Diploma. Alongside her BTEC pathways, Aleena has also worked extremely hard to achieve her GCSEs in English and Maths, achieving her Maths C grade in 2017 with her English C grade in sight this year. English is Aleena’s fifth language after Urdu, Punjabi, Spanish and Catalan. She has had to overcome an enormous language barrier through her determination to succeed. Aleena is now progressing on to the University of Central Lancashire to study Fashion Design. 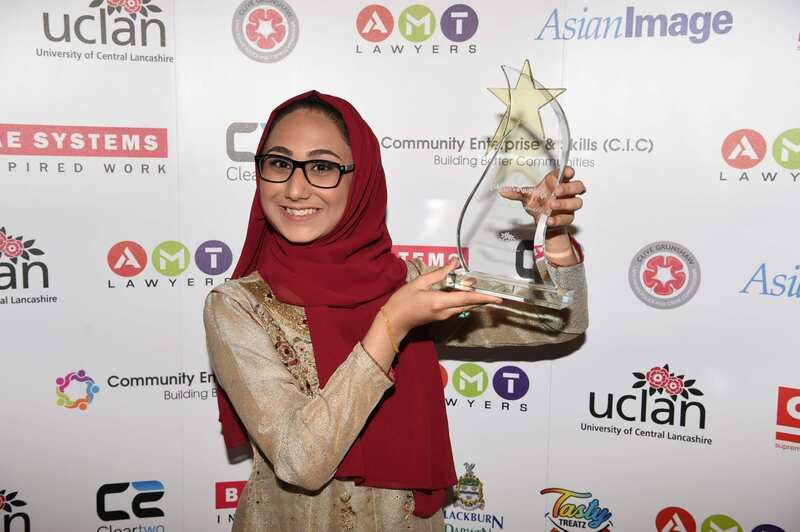 On receiving the award, Aleena, 19, said: “It’s an awesome feeling! The ceremony was fantastic and very welcoming. I felt like a star! It was such an honour for myself and my family. During her time at college, Aleena has supported the ‘Stand Up To Cancer’ Fashion Show, working with other students from the college’s Creative and Digital and Hair and Beauty departments helping raise money for local Cancer Research UK fundraisers, as well as having her outstanding work showcased during the annual Art and Design End of Year Show. She showed her entrepreneurial flair by negotiating her own work experience to teach at St Philip’s Primary School in Nelson while dropping off some of her younger family members at the school. In total, she has completed over 50 hours of teaching, relishing the chance to pass on her knowledge and skills to younger generations and fuel her future ambition to teach professionally, while leaving a lasting impression on the school’s leaders. In its 2016/17 results, Nelson and Colne College achieved a 99.7% pass rate at A Level and a 100% pass rate in vocational courses. The college is top in the country for 16-18 learner achievement, at all levels, number one in the country for A Levels, based on progress scores, and the number one college in the country for overall Apprenticeship achievement, at all ages and levels. One in five of NCC’s 2016/17 leavers progressed on to a Russell Group university.